Since I knew that it had at least two songs, I figured that it would be a musical. By the time Brad and Janet got their flat tire during a thunderstorm late at night in the middle of nowhere and decided to go to a castle to ask to use a phone, I’d figured out that this was definitely an affectionate parody of sci-fi/horror movies. I was already hooked. Then Dr. Frank-N-Furter took off his already-awesome cape to reveal his iconic outfit underneath. That’s when I realized that this movie was truly nothing like anything I’d ever seen before. As its distinct brand of insanity escalated at every moment, I just became more and more enthralled with the movie. The Rocky Horror Picture Show really benefits from repeat viewings. The first time you watch it, it’s so overwhelming (in a good way) and fast-paced that many plot developments seem to come out of nowhere––– sometimes literally. Like Eddie, who busts out of a freezer in the wall on a motorcycle, sings an entire high-speed rock and roll number, and is murdered by Frank-N-Furter before we even know how he relates to the story. For first-time viewers––– or “virgins,” as they’re affectionately called by Rocky Horror fans––– it’s like Eddie rode in from Grease, and everyone just went with it… except Frank-N-Furter. Don’t steal his spotlight. There are so many “little things” in this movie that I find laugh-out-loud funny. The backup singers singing, “Janet,” and “Oh, Brad,” in complete boredom as they mechanically change the church setup to accommodate a funeral, including rotating the flowers, which apparently are white on one side and black on the other. Dr. Scott bobbing his shoulders to the beat in direct contrast to his serious, intense facial expressions during “Eddie’s Teddy.” I even laugh when The Criminologist starts off the instructions on how to do the “Time Warp,” even standing on his desk to do the famous “jump to the left.” On repeat viewings, you just find more and more of these small moments that have you “shiver” with laughter! Every actor is really well cast. Barry Bostwick is consistently hilarious as the straight-laced Brad Majors (A Hero) who’s trying to keep everything under control and keep his cool––– until, of course, he loses both. Susan Sarandon is hysterical as Janet Weiss (A Heroine), and makes her arc really engaging as well as entertaining. Tim Curry, obviously, is a total treat as Dr. Frank-N-Furter (A Scientist), switching from comedic and lustful to downright psychopathic with no warning and showing just how unhinged he really is. Richard O’Brien is a downright delight as Riff Raff (A Handyman), giving him a comic seriousness and intensity as well as mystery. Patricia Quinn brings a fun sense of mystery to Magenta (A Domestic). “Little Nell” Campbell is a manic force of enthusiastic energy as Columbia (A Groupie). Meat Loaf takes advantage of every second he has on screen to make us love Eddie (An Ex-Delivery Boy). Jonathan Adams is constantly funny as Dr. Everett Scott (A Rival Scientist), as he tries to stay serious, even as his shoulders start bobbing during “Eddie’s Teddy” or his legs start kicking during the floor show. 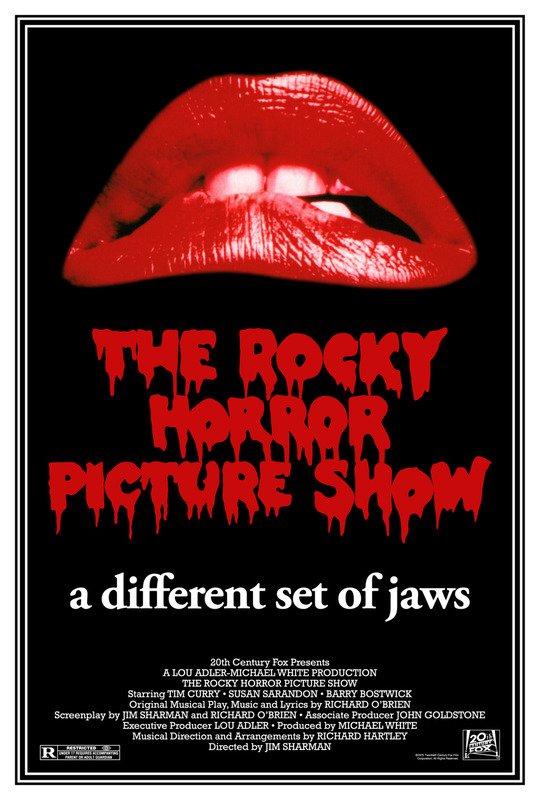 Peter Hinwood gives a sweet innocence to Rocky Horror (A Creation). And the one tying it all together, The Criminologist (An Expert), is expertly played as a serious analyst (who certainly has his work cut out for him) by Charles Gray. The Rocky Horror Picture Show has even further appeal for me because Richard O’Brien, who plays Riff Raff, wrote the book, music, and lyrics for The Rocky Horror Show and co-wrote the screenplay that became the quintessential “cult classic.” As someone who’s also an actor and writer (among other things), I always feel encouraged when I see people who both perform and work behind the scenes. There are a lot of us out there, and I believe our ranks are growing! As much fun as it is to watch any film you love by yourself in your own home, it’s also a wonderful experience to watch it on the big screen with a group of people who love it, too. With The Rocky Horror Picture Show, this is even truer! Rocky Horror is famous for its passionate fans, and their joy and sense of fun during screenings of the movie is as contagious as the movie’s many songs! Whether you’re a Rocky Horror “virgin” or not, if you have any interest in The Rocky Horror Picture Show at all, you have to see it in an interactive screening that invites audience participation. People come in costume, most venues sell bags full of props with instructions on how to use them so you can take part, people shout “callback” lines during pauses in dialogue, and, of course, everyone sings along to the songs and dances along to the “Time Warp”! (If you don’t know the famous dance, don’t worry: the song will teach you how to do it!) Some screenings even have “shadow casts” who act out the film while it plays on screen. The Rocky Horror Picture Show is relentless. It’s relentlessly funny, it relentlessly throws you song after song that will have you dancing in your seat and singing when you leave the theater (which can sometimes be awkward, depending on the song), and just when you think it can’t get any crazier, it smacks you upside the head with something to prove you very, very wrong. On a side note, I have to wonder… what would’ve happened if Brad and Janet had taken Dr. Frank-N-Furter up on his first offer and said, “Yeah, sure, let’s take in an old Steve Reeves movie”? … By the way, the song I loved enough to ask about is the iconic “Time Warp.” The other song is “There’s a Light (Over at the Frankenstein Place).” If you ever make it out to Six Flags’ Fright Fest, do yourself a favor and go see Love at First Fright.